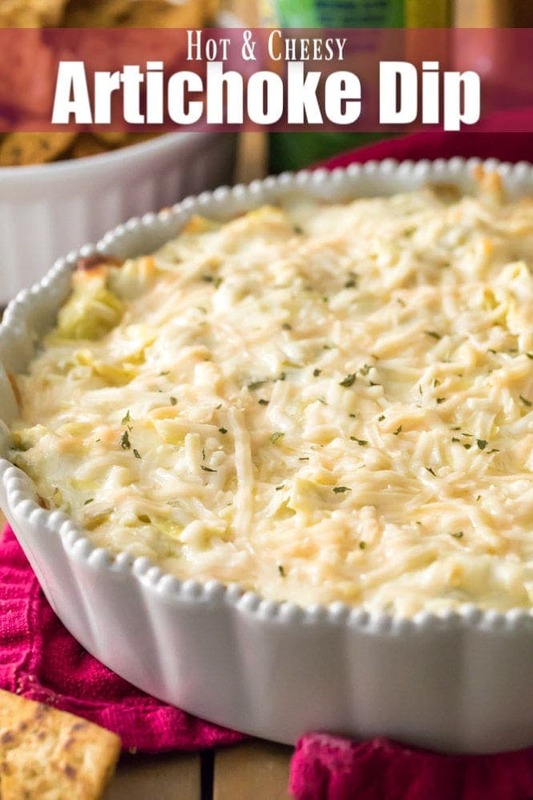 A rich and creamy Artichoke Dip! Served hot and bubbly with pita chips, corn chips, or your favorite dipper of choice. 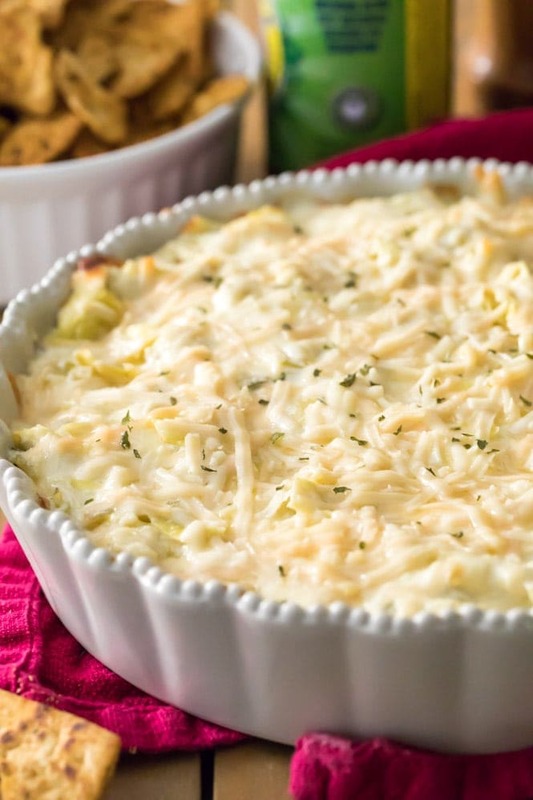 Artichoke Dip is fast and simple to make and would be a great option to serve during the Big Game! Be sure to check out my quick how-to video below the recipe! 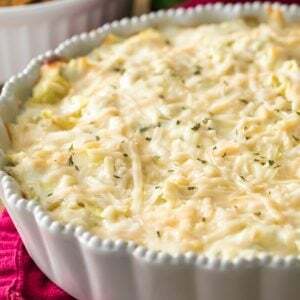 As I promised last weekend, I have one more dip recipe I wanted to squeeze in before the upcoming Big Game: Today’s Artichoke Dip! 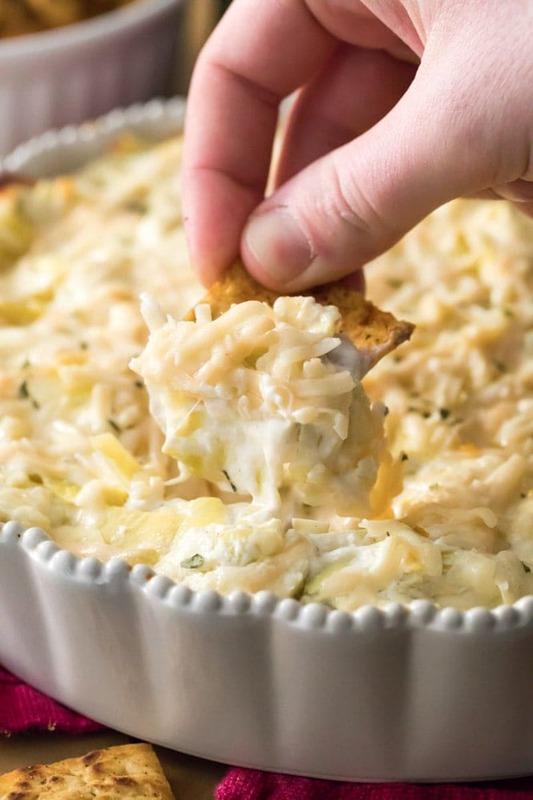 Artichoke Dip joins the ranks of some of my favorite dips, (you should also check out my Taco dip and Buffalo Chicken Dip) and I highly recommend trying it out this weekend, whether you’re watching the game or not. Plus, I’m not sure what the weather is like where you are, but we’re in the midst of a “Polar Vortex” right now and one of the best remedies for that is hot comfort food! And of course your favorite chip for dipping! 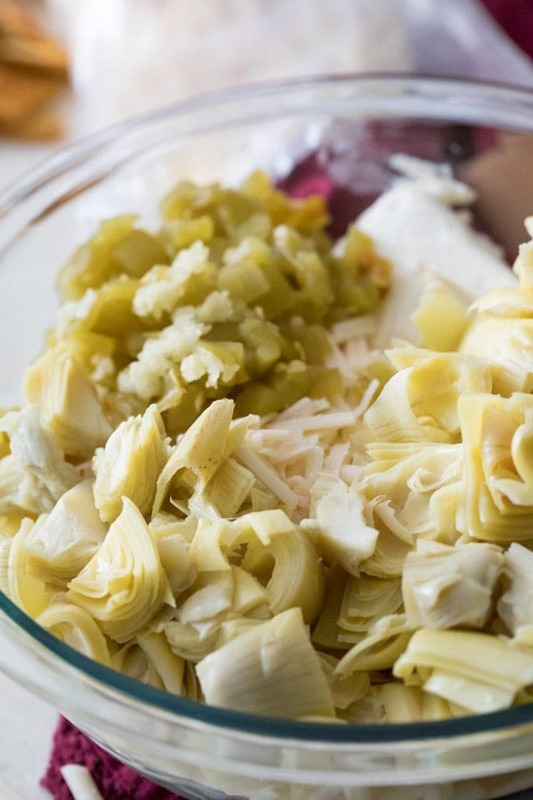 What do You Serve Artichoke Dip With? Preheat oven to 375F (190C) and lightly butter a glass 9” pie plate (or an 8x8 glass baking dish). Set aside. Combine cream cheese, sour cream, mayo, pressed garlic, artichoke hearts, mozzarella cheese, ½ cup parmesan cheese (56g), and roasted chilis in a large bowl. Stir well until completely combined. Spoon ingredients into prepared baking dish and top with remaining ½ cup (56g) shredded parmesan cheese. Transfer to 375F (190C) oven and bake for 20-25 minutes and cheese on top is melted and mixture is bubbly and heated through. 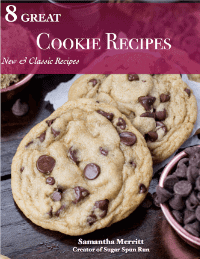 Easy to make and very delicious. Thank you. Can this be made in advance and frozen? Hi Josie! You could freeze it, but the sour cream may cause some differences in the texture when thawing it, so I don’t know if it will be as good after frozen.